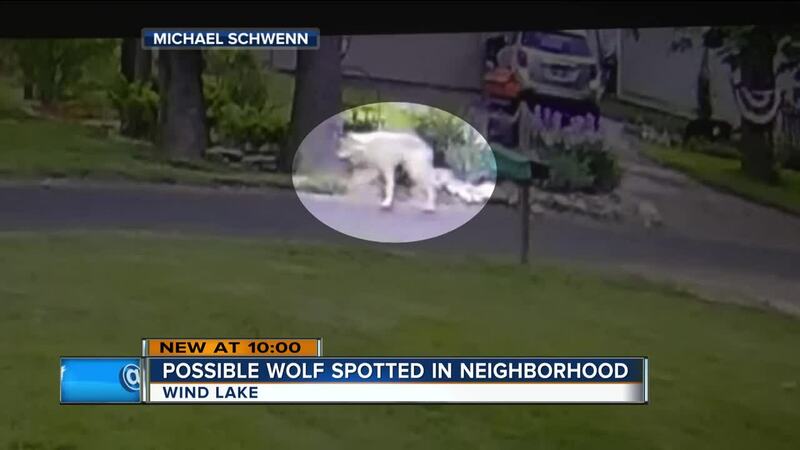 Home security footage captured a large dog-like creature stalking a neighborhood in Racine County and now the Wisconsin DNR is trying to determine whether or not the animal is a wolf. If it is a wolf, it would be the first confirmed sighting in Southeast Wisconsin in three years. 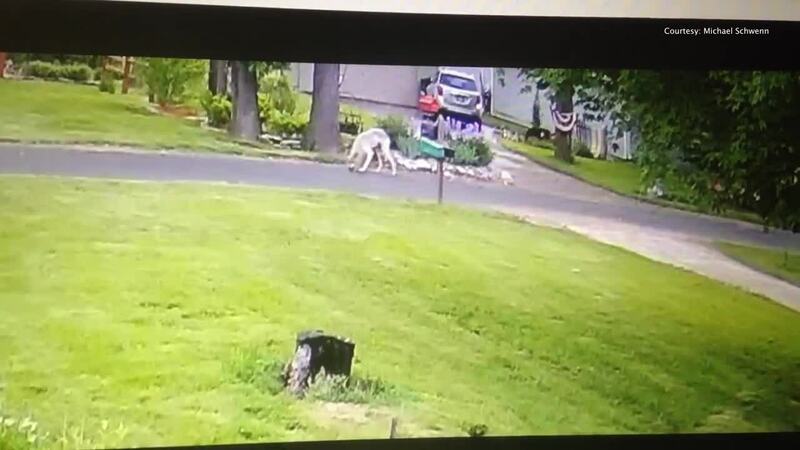 Michael Schwenn shared the videos with TODAY’S TMJ4 and said they were taken between 5:05 and 5:15 a.m. in Wind Lake on Monday. His neighbors, Peggy and Dean Dolski had not seen the animal but were worried after seeing the videos. "It scares me because a lot of people around here have little dogs like ours and we always walk up and down [the street]," said Peggy. Dianne Robinson, a wildlife biologist with the DNR said they did receive a call about the animal, but the video helps a lot. "We can't at this point determine whether it's a coyote, a wolf or a wolf-dog hybrid," she said. "Definitely something of interest and something unusual." DNR officials are going to conduct a site visit Wednesday to measure nearby landmarks like bushes to determine an approximate size of the creature, which could help rule out certain species. "At the shoulder, a coyote's going be more in the 20-inch range where a wolf is going to be in the 27 inches range," said Robinson. "It’s a pretty big difference. If we can get out there and we can get a measurement of the animal in the video itself, that will really help us be able to rule out one way or the other." The Wisconsin DNR has not reported any wolf depredations , harassments, threats or complaints in Racine County in 2018. Most un-confirmed wolf complaints ended up being coyotes. There have not been any documented wolf sightings in Southeast Wisconsin since 2015, the last one happened in West Bend, but officials say it's not out of the realm of possibility that the creature is a wolf. "It's rare, once every couple of years," said Robinson. "This would be our once every couple of years. It would be cool, it would be interesting to see." She said if it is a wolf, it's likely a young wolf leaving its birth territory to find a new territory. Once it doesn't find a mate, it will move on from the area. Because Robinson says there is no resident wolf population in that area of the state, the animal likely won't find a mate. She also said residents shouldn't be too concerned but should keep a closer eye on small animals, even if it ends up being a coyote. She said technically, wolf-dog hybrids are supposed to be registered with the DNR. More information about wolf populations in Wisconsin can be found here. The DNR also asks that residents use this observation form to report any sightings.